You care for the people and things you hold most dear to you. If you had to list five fab things about your children, your husband or your dog, you would probably rattle them off like there’s no tomorrow. You love and appreciate everything about them (usually). Now what if you had to list five fab things about you? 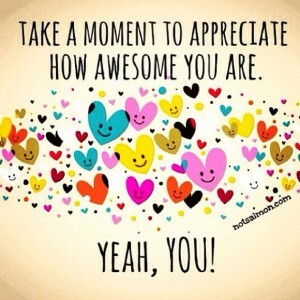 Do you love and appreciate you? Could you write down a few great things about yourself? It’s so easy to recognize achievements, strengths and good stuff in others but we seldom take the time to appreciate ourselves. Most of us weren’t brought up to give our own fabulous selves a shout out. That would be “bragging” and probably frowned upon, right? Self-love is a good thing. It’s positive. It’s self-care and it’s necessary. Appreciating who we are may be a whole new concept but it’s time. It’s allowed. I give you permission. Grab a piece of paper or your journal. Set a timer for 5 minutes and make a list of all the things that are awesome about YOU. When the 5 minutes are up..I give you permission to keep on writing. And add to the list every day. 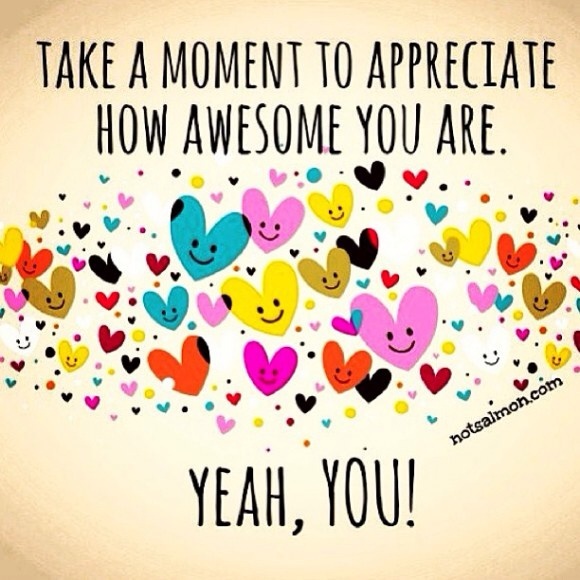 It’s time to love and appreciate you!